We have started an exciting new initiative at Elsenham C of E Primary to allow children to lead their own learning and that of others. Children are being selected to work with subject leaders to plan and deliver group sessions for children younger than them. All year groups are taking part in the exciting scheme so they can share their learning and expertise. Have you got what it takes? These children have! Take a look below at what they have been doing! The girls did a story writing workshop. They started with an input session on the carpet to explain to the children how to write a brilliant story and the main features they will need. They then divided into two groups and worked at tables to make various plans and story maps. Alana and Kaja planned two sessions to help children in Year 1 with their story writing skills. They spoke through the main parts of the story, picking characters, ways of planning and top tips for writing stories. They then gave the children support to write their own. 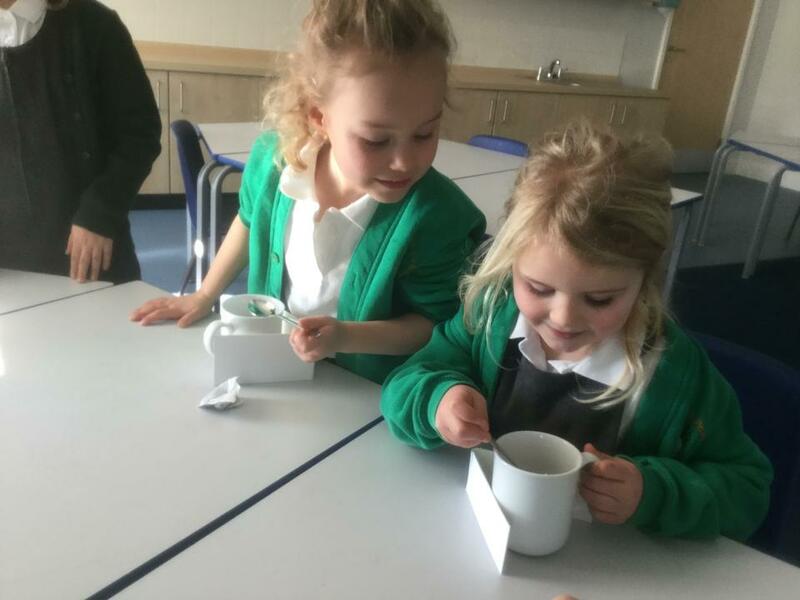 Matilda and Florence were keen to get started with their Leaders in Learning role. 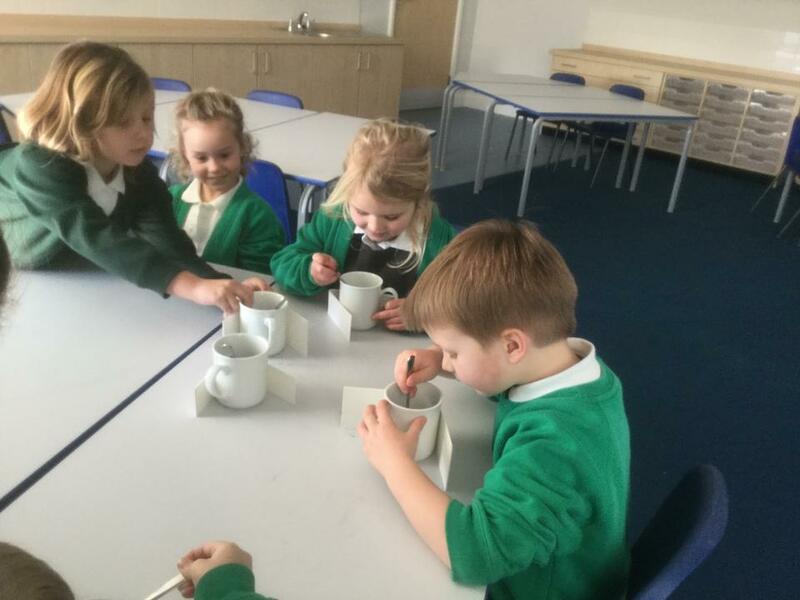 They met with Miss Lucas to discuss an experiment that they could get Cherry Class involved in. They decided to show the children the process of dissolving and how solids can turn into a liquid. They organised their resources and ensured children were involved in their experiment. 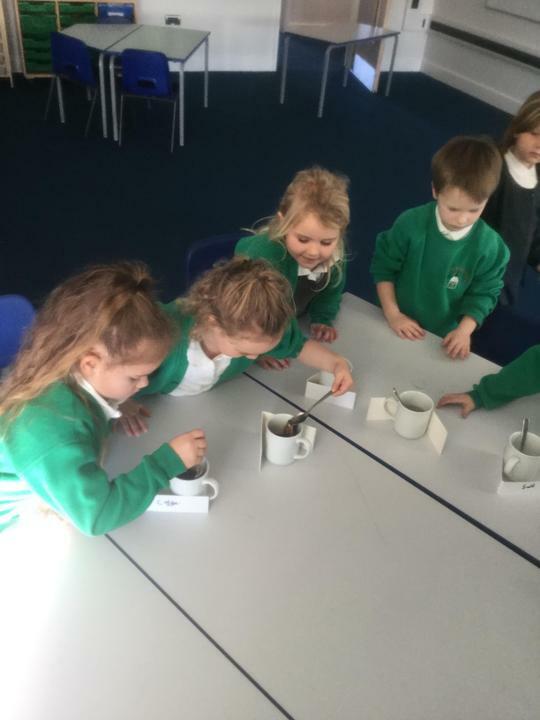 They tested coffee, tea, sugar, salt and flour. 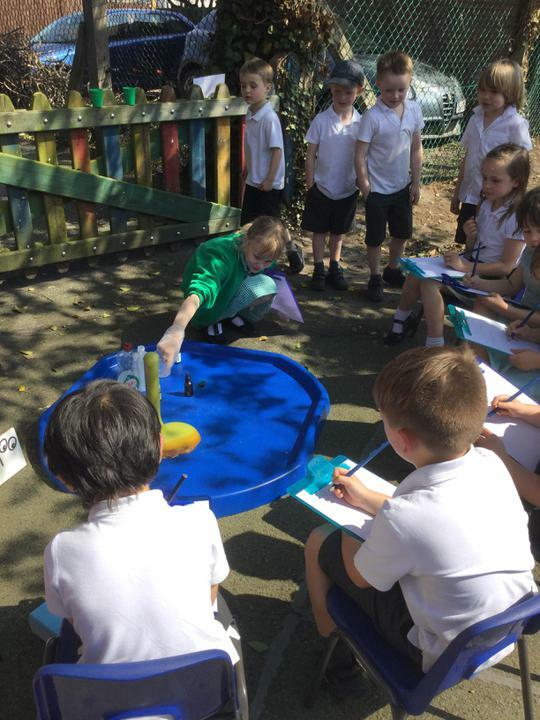 They clearly explained to the group what dissolving means and gave Cherry class a hands on experience to see how the solids changed. Elsie from Cherry Class told Miss English - "My one didn't dissolve, even though I mixed it!" While Abi said "Mine dissolved quickly, that means it disappeared and I couldn't see it anymore". Well done! Great Leaders in Learning. Forrest and Daisy spent a long time thinking of inspiring games that they could teach Acorn class, to help the little children improve their phonics skills. 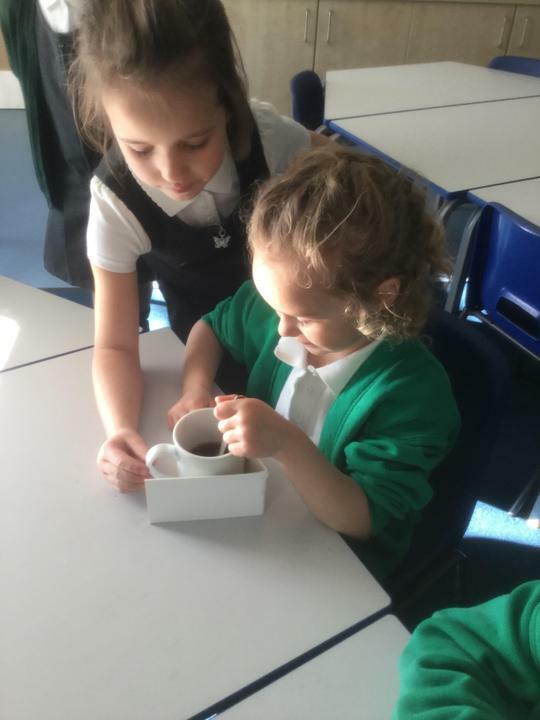 Both children showed their dedication to their new roles before their teaching session even began; as they suggested spending one of their lunch times with Miss English to plan their session! 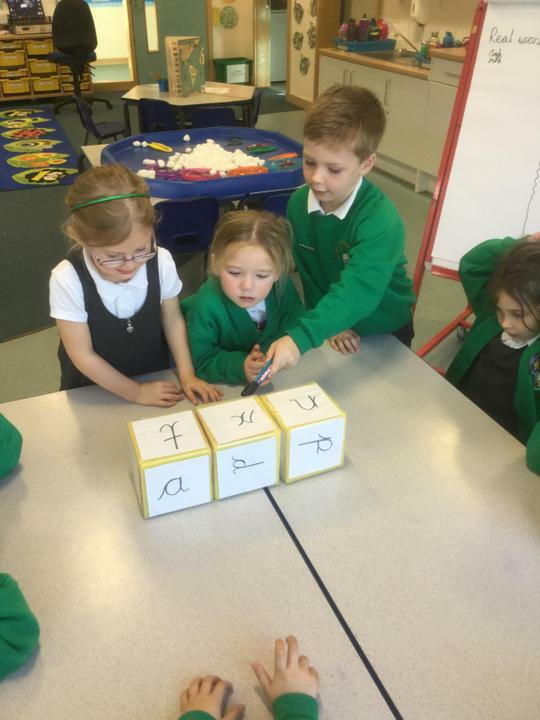 During their own phonics session, Forrest and Daisy came to Acorn class to carry out their planned phonics session. 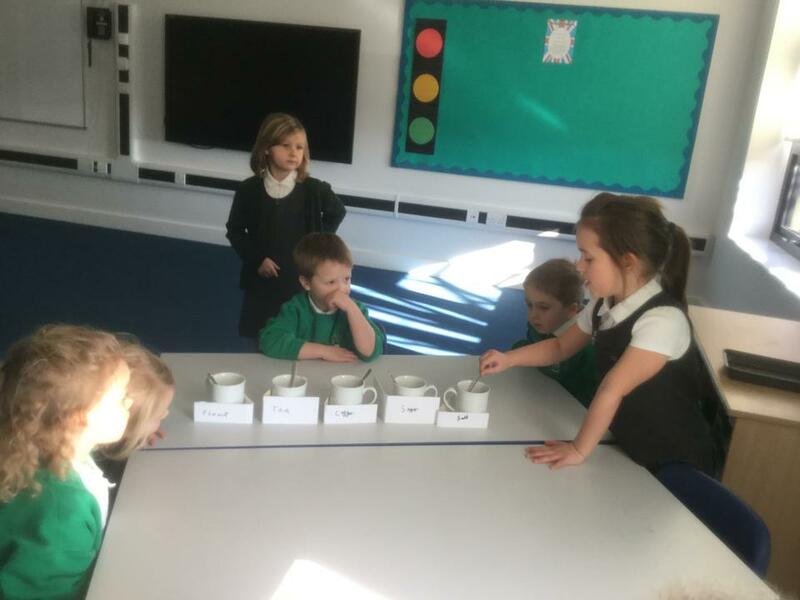 The Acorn children were excited to have two older children come to their class to play a game with them and they were (as always) on their best behaviour. Each of the children were able to read some simple three letter words, explaining why they thought each word was real, or nonsense. Thank you so much to Forrest and Daisy for their hard work, planning and teaching. Acorn class learnt a lot and can’t wait to play another phonics game with the phonics ‘Leaders in Learning’ soon. 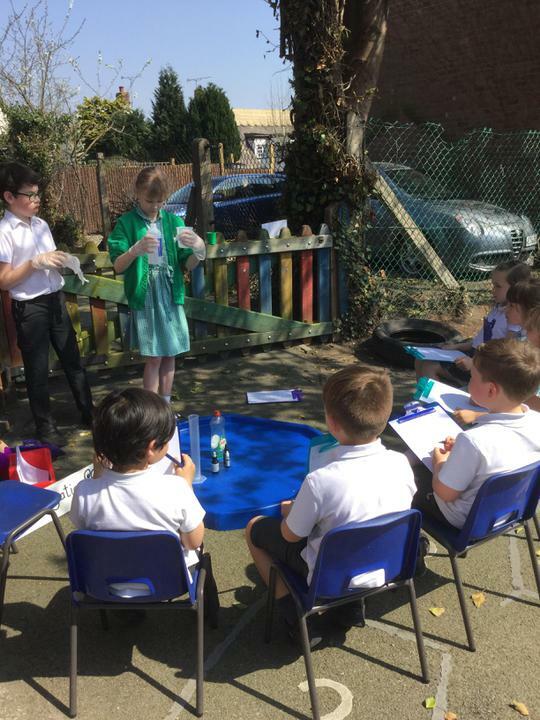 The Science Leaders in Learning worked with Miss English to prepare their science session for a group of Year 1 children. First they researched online and decided which experiment they would like to carry out. 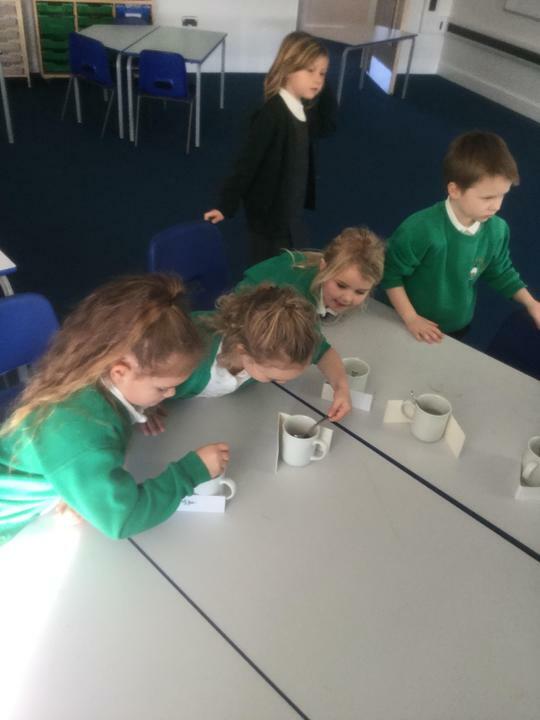 They thought carefully about the science involved and how it could be explained clearly for the younger pupils. 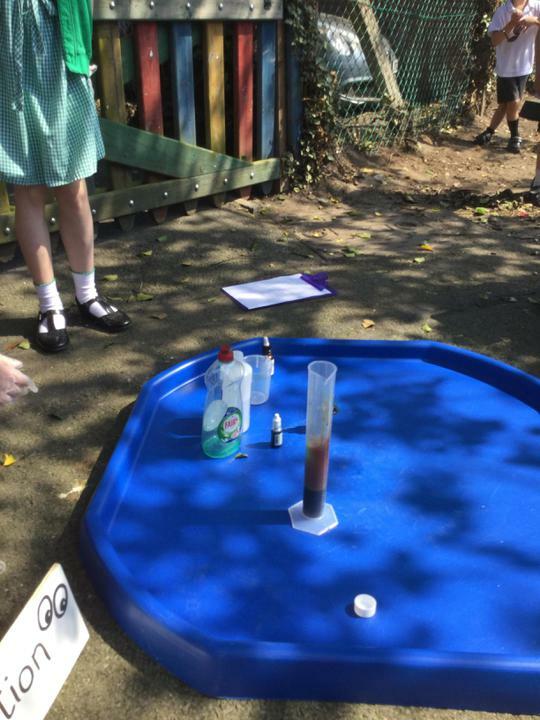 They then carried out the experiment a few times with Miss English to ensure it would be successful, before delivering their session to the children. 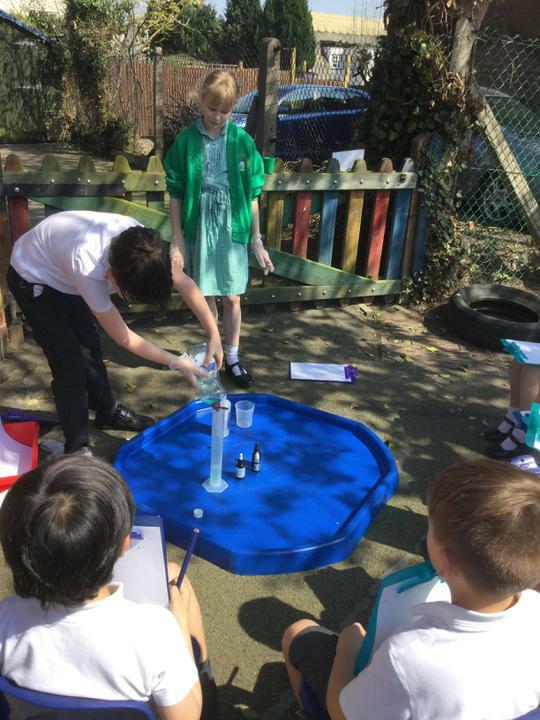 The Science Leaders in Learning asked the children to predict what would happen and explained the term ‘chemical reaction’. 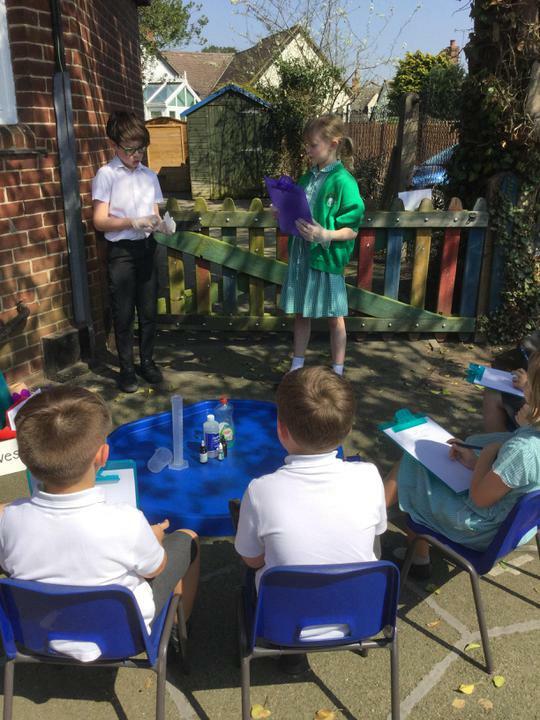 They briefed the children on the need for safety during science and during the session they asked the group to record their predictions and actual results. A very big thank you and well done to our science Leaders who worked so hard to inspire our younger learners. 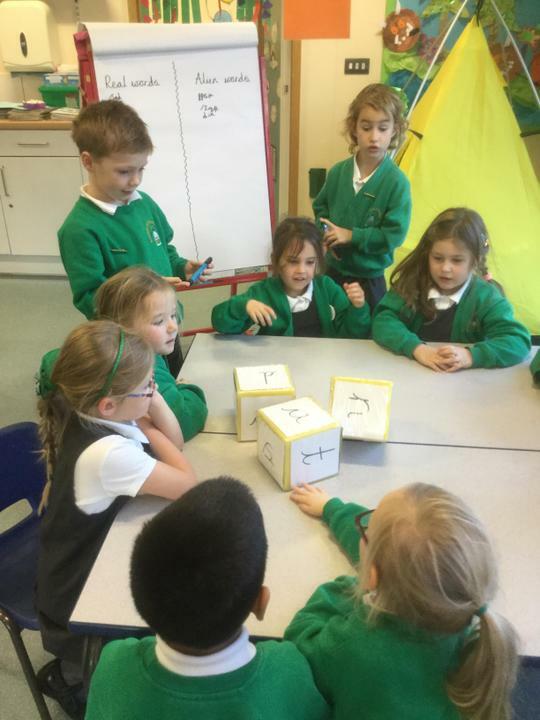 The Maths Leaders in Learning worked with Miss Newman to come up with a maths challenge that would engage the Year 1 children. They decided to plan a game that would be both fun and test their number bonding skills up to 20. They came up with a game of bingo with the Leaders in Learning designing their own bingo boards with numbers up to 20. 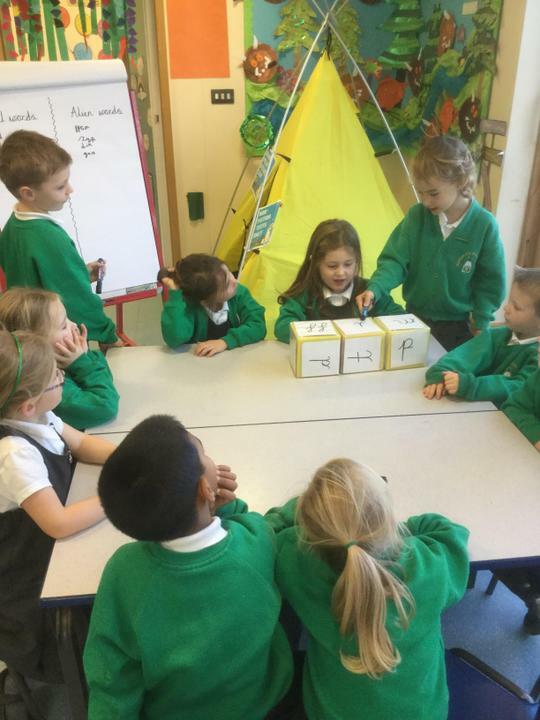 The Leaders in Learning explained the rules to the children and gave them bingo boards and counters to cover when they thought they had the answer on their boards. The children decided to also test the children’s subtraction skills if they seemed to be finding addition too easy. The Leaders in Learning really engaged the children and rewarded everyone who took part with marbles and extra marbles for the winners. The Year 3 pupils were really impressed with the Year 1 children’s number skills.